Make money from your own videos on YouTube 2017 Update. Imagine you have a machine that can make money. Isn’t it interesting? YouTube is like a machine that can make money as much as you want. So the big question is how! YouTube is the second largest search engine after Google. YouTube is owned by the biggest tech company Google. YouTube is the platform where a publisher can make money by uploading their own videos. At the moment, when you’ll upload your own videos on YouTube you will be a partner of YouTube. So, there is a question, why YouTube will give you money for uploading videos? Another important question, why you be paid? YouTube is a large website where a publisher can upload their own videos and advertiser can promote their business. Their middle media is Google AdSense. 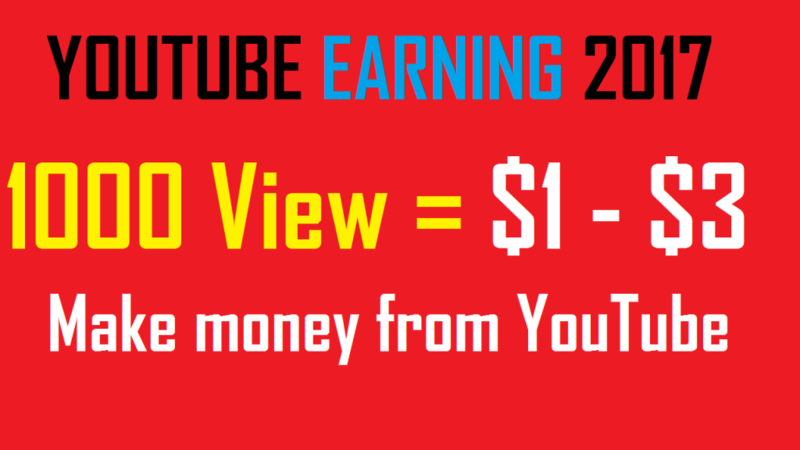 In general, you can make money from YouTube when viewers will watch your video. In my own experience, you will get $1 for a 1K view. The recent update of YouTube is, before monetarization your video you need to get a 10,000-lifetime view. Once you complete these criteria your YouTube Channel will be qualified to show ads. First, you have to log in to your Gmail. Second, you have to go in YouTube channel. Third, pick a channel name. Fourth, upload your own video. Fifth, share your videos on social media. Sixth, wait to get the 10,000-lifetime view. Once you complete your lifetime view criteria then you are able to monetarize your channel. The most important thing is that YouTube is very serious about copyright video. Never try to upload others video. If you do it, your channel will be suspended. The earning is completely depend on various things. At first, obviously, the view is every important and second is location and third is viewer’s devices. When your most of viewers are came from USA, Canada, Australia, UK then you will get $2+ for thousand views. When your most of views are from Asian countries like India, Pakistan, Bangladesh, etc then you will get $1 or less for thousand views. How to get western viewers on my YouTube channel? I thing if you are not from western countries you should not try to get the western view on your YouTube channel. There are many facts behinds, you have full knowledge about your country or culture. For example, if you are from India but you want to open a YouTube channel about basketball of the USA, which is not a good idea. Rather, it would be better if you work with Indian cultures. Another thing, if you have full knowledge of any western cultures then you can implement on your YouTube channel.